Project i is way past the point of no return. The task force headed by Ulrich Kranz is already knee-deep in prototyping with both i3 and i8 undergoing early on-road trials in Miramas (BMW's own proving ground near Marseilles) and near the Arctic Circle. First spy shots show heavily camouflaged cars, but not even the swirly shower curtain foil can disguise the radical proportions, the large-diameter skinny wheels and the extrovert aerodynamics. The BMW i programme is so big one could almost be forgiven for calling it the reinvention of the motor car. Not only because of the revolutionary engineering and design concept, but also because of the scale of the whole operation. The installed production capacity will stretch close to 100,000 units per year, the expertise in the field of carbonfibre, battery technology and performance electronics is believed to yield a significant competitive advantage. The relation between i1, i3 and i5 is said to resemble that between Polo, Golf and Golf plus/Touran. i1 was at one point a tiny two-seater aimed squarely at the smart Fortwo. In a next step, it morphed into a three-seater with a transverse accommodation for the back bencher. Now that Smart has kicked off the second-generation Forfour featuring rear suicide doors, BMW seems happy to settle for a more conventional 2+2 layout. i5 is in essence a stretched i3 with a slightly taller roof and a longer rear overhang for added cargo capacity. Its main rival in the market place should be the upcoming Toyota Prius PHEV-MPV. 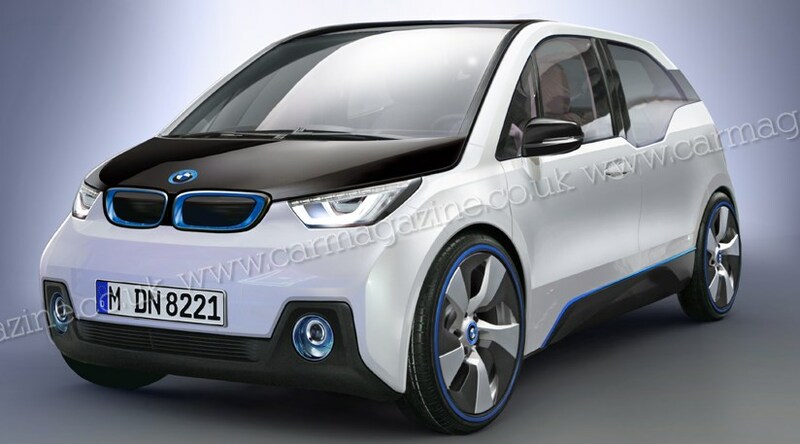 The i3 will have to compete against the allegedly even more frugal Audi A2 earmarked for 2014. Common to all BMW i vehicles are the so-called Life and Drive modules, denoting the carbonfibre body and the rolling chassis made of aluminium. Unlike BMW's front-engined products, i1, i3 and i5 are rear-engined. This sounds dynamically challenging, but the engineers claim that the cleverly packaged battery kit dubbed energy wedge warrants a perfect 50:50 weight distribution. Other benefits are said to include a low centre of gravity, the tight turning circle, a clear traction and grip advantage, and the excellent crash performance masterminded by fifteen different load paths. All three rear-engined models sport a spring strut front axle and a multilink rear suspension. Supported by innovative kinematics and state-of-the-art electronics, BMW promises entertaining yet totally failsafe handling qualities. i1, i3 and i5 will be available in BEV and PHEV form. The BEV relies solely on its 170bhp electric motor which propels the 1250 kilo i3 in 7.9sec from 0-62mph. As a range-protecting measure, the top speed is limited to about 95mph or 150kph. While the i1 is slightly quicker off the mark but not faster overall, the i5 needs three tenths longer to get going, sources say. Customers suffering from severe range anxiety who need more than 100 miles between charge-ups can specify a range extender. The REX model employs a normally-aspirated 1.5-litre three-cylinder petrol engine rated at about 80bhp to generate an extra 50 miles. The range extender charges the battery, but it does not drive the wheels. The car's CO2 footprint does of course depend on the primary energy source. It is in this context worth noting that all BMW i facilities will use 100% regenerative electric power, and that the terms green aluminium and green plastics denote a high recycling content of 25% or more. All BMW i models come with such innovative driver assistance systems as One Pedal Control (accelerate, decelerate and coast by throttle order), Active Brake Control (works up to 40mph and includes pedestrian recognition), Park Assist (including automatic navigation), Congestion Assist (works up to 25mph and includes active steering), Range Assist (shows all available charge points and takes you there on demand), Precondition Assist (cooling down, heating, charging - all by smartphone) and Navigation Assist (connects with bus and rail services - just in case...).